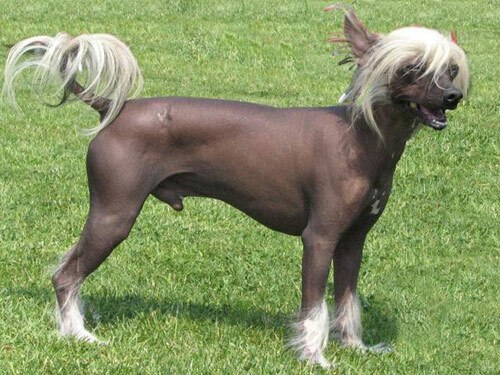 The Chinese Crested Dog has many desirable qualities. It is a breed that loves to play and makes a tender companion. The Chinese Crested Dog is very loyal to its owner and aims to please. This breed gets along well with other dogs, animals, and people it does not know. The Chinese Crested Dog is generally a happy and alert breed that is aware of what is happening around it. It is unknown exactly where the Chinese Crested Dog is derived from. Many hairless dogs appear to have arisen through mutation worldwide, with many being perpetuated in Central and South America. The Chinese Crested Dog is believed to have a dissimilar development with this breed appearing in Africa and coming to China back in the thirteenth century. This breed was used on ships by Chinese seaman because they did not collect fleas and could hunt down rats. The Chinese Crested Dog was also a trading item, which spread their existence to many countries including Turkey, Egypt, South Africa, and maybe even South and Central America. There is no record of the breed in Europe until the 1800s where they can be seen in photographs and paintings. Around the same time, an American woman by the name of Ida Garrett began an effort to popularize the Chinese Crested Dog and other hairless dogs. Over time, several breeders, including Gypsy Rose Lee, helped to increase the popularity of the Chinese Crested Dog in Europe and America. The breed finally became recognized by the AKC in 1991 after years of effort. The Chinese Crested Dog has quickly become a favorite for dog shows, but has not gained the same popularity as a house pet.